Once you have been invited to an interview you must get ready to create the image of someone they will surely want to hire above all other job applicants. Everybody has an opinion as to how you do that, but what do you actually do and what do you say? Self-introduction is your key to interview success because you are starting from a baseline position where they have no experience of who you are or what you are like. Yes, they should have read your resume and cover letter you sent in, but that only gave them enough for them to want to see you in person. Now you are going to meet the hiring manager in person, you have a one-off make or break opportunity to get them to see you as the only person they want to employ. As you know, interviewers will often rely heavily on their first impressions, to the extent that the interview becomes merely a confirmation of that first impression, either good or bad. So if self-introduction is your key to interview success, the first and most important aim is to create a positive first impression. Everybody has an opinion as to how you do that: look ‘em in the eye, give ‘em a firm handshake, speak up and don’t mumble; know your stuff. All good ideas, but what do you actually do and what do you say? The way to create a favorable first impression is to be sure you appear confident and open. When you meet your interviewer for the first time, make eye-contact at the introduction and repeat the interviewer’s name as you shake hands and thank them for inviting you to the interview. As you get seated, smile to indicate you are ready to get down to business. What often follows is the invitation to ‘tell them about yourself’ which allows you to commence your self-introduction that is so important to your interview success. This is the phase where you develop the rapport that will carry you through to the positive outcome at the end of the interview. Because self-introduction is your key to interview success, you must have previously prepared exactly what you are going to say. This is not some lengthy story about your life, but a short focused statement that sounds interesting to the listener. You make it interesting by keeping it short (less than 3 minutes) and by showing that you are interested in both the job and the organization. This means you need to do some research about the business beforehand. In your self-introduction you will include some examples of your strengths and achievements which relate directly to the requirements of the new job. This must also demonstrate your personal qualities that you apply when you are doing the job because the type of person you are is often far more important then just having the ability to do a job. The way you outline your self-introduction, in particular the way you speak, tells the interviewer whether you are confident in your abilities so you must rehearse it well, but don’t try to be what you are clearly not – you’ll only be found out at a later date. Get a friend to listen to your self-introduction with a critical ear, because if it sounds false it will set the alarm bells ringing with the interviewer who will detect that it is not the real you and destroy the rapport you were building up. Practice speaking faster or more slowly, louder or quietly and try to vary it throughout. The answer is that the interviewer needs to identify the best candidate to hire, whilst keeping the costs to a minimum and the fewer people interviewed the better. The need is also for the person who appears to be the best ‘fit’ in terms of both personality and technical ability. Also remember that they may need to justify their decision to hire you, to someone higher!Prepared well, this self-introduction is your key to interview success because it helps to create that all-important first impression, helps you to build the rapport with the interviewer and satisfies the questions about whether you are the sort of person who will fit in to the organization successfully. C language is a general purpose and structured programming langauge developed by 'Dennis Ritchie' at AT &T's Bell Laboratories in the 1972s in USA. 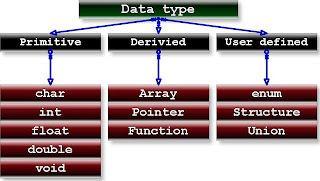 It is also called as 'Procedure oriented programming language. C is not specially designed for specific applications areas like COBOL (Common Business-Oriented Language) or FORTRAN (Formula Translation). It is well suited for business and scietific applications. It has some various features like control structures, looping statements, arrays, macros required for these applications. 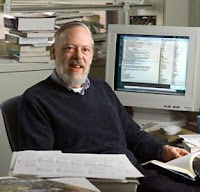 After a long illness, Dennis Ritchie( September 9, 1941; found dead October 12, 2011), father of Unix and an esteemed computer scientist, died last weekend at the age of 70. 1970 B Ken Thompson at AT & T's Bell Laboratories. 1972 C Dennis Ritchie at AT & T' Bell Laboratory. The development of C was a cause of evolution of programming languages like Algol 60, CPL (Combined Programming Langauge), BCPL (Basic Combined Programming Language) and B.
Algol-60 : (1963) : ALGOL is an acronym for Algorithmic Language. It was the first structured procedural programming language, developed in the late 1950s and once widely used in Europe. But it was too abstract and too general structured langauage. CPL : (1963) : CPL is an acronym for Combined Programming Language. It was developed at Cambridge University. BCPL : (1967) : BCPL is an acronym for Basic Combined Programming Language. It was developed by Martin Richards at Cambridge University in 1967. BCPL was not so powerful. So, it was failed. B : (1970) : B language was developed by Ken Thompson at AT & T Bell Laboratories in 1970. It was machine dependent. So, it leads to specific problems. C program executes in following 4 (four steps). 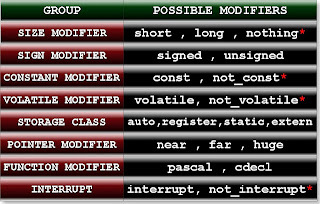 An editor like notepad or wordpad is used to create a C program. This file contains a source code which consists of executable code. The file should be saved as '*.c' extension only. The next step is to compile the program. The code is compiled by using compiler. Compiler converts executable code to binary code i.e. object code. The object code of a program is linked with libraries that are needed for execution of a program. The linker is used to link the program with libraries. It creates a file with '*.exe' extension. The final executable file is then run by dos command prompt or by any other software. 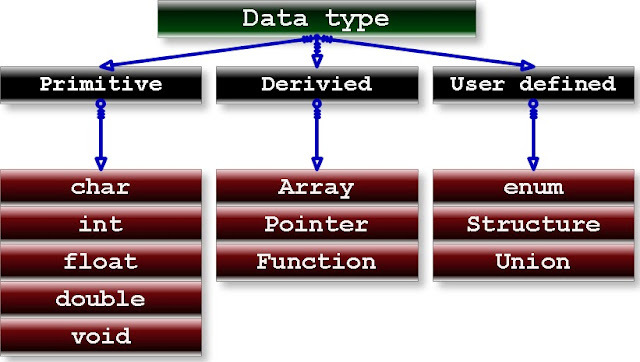 A complete picture of all c data types has been represented by following figure. 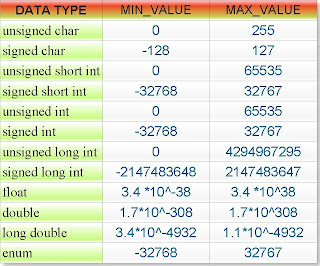 Note: Apart from these basic data type there are few other data types which have been defined inside header files which will be discussed later. 1. 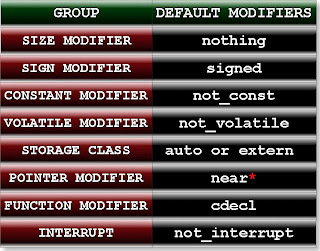 Default modifier of storage class is auto when we declared the variable inside any function and default modifier of storage class is static when we declared variable outside of all functions. In other word we can say if variable has declared locally then default storage class is auto and if it has declared globally then default storage class of variable is extern. 2. 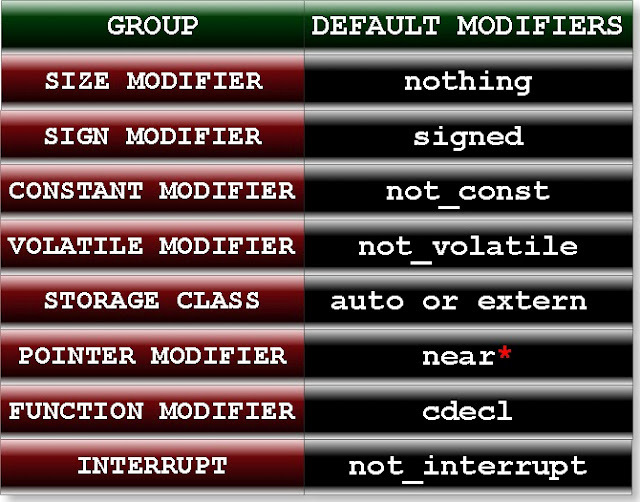 Default storage class of function is extern. WHAT IS MEMORY MODEL IN C? Rule 1: We cannot use two modifiers of same groups in any particular data type of c.
Question: Is following declaration is valid in c? 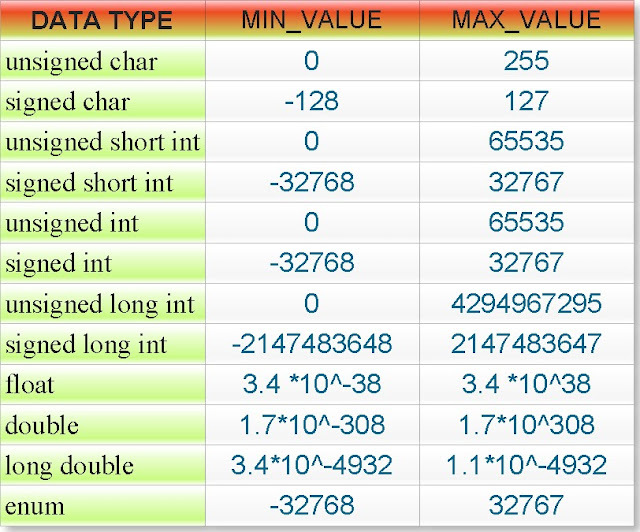 First four declarations are valid as well as equivalent. But last two declarations are invalid. In c all variables are by default not constant. Hence, you can modify the value of variable by program. 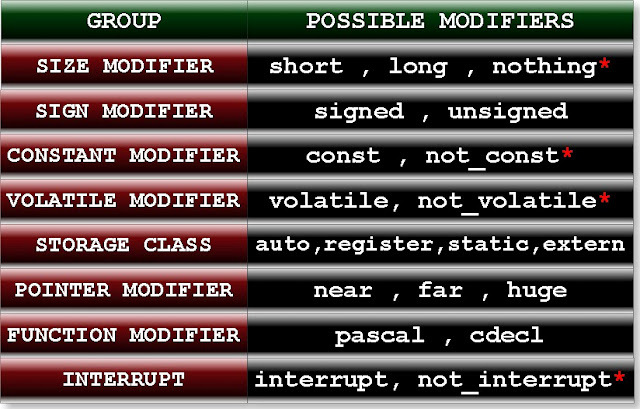 You can convert any variable as a constant variable by using modifier const which is keyword of c language. If you have declared the uninitialized variable globally then default initial value will be zero in case of integral data type and null in case of non-integral data type. If you have declared the uninitialized const variable locally then default initial value will be garbage. 3. Constant variables executes faster than not constant variables. HOW TO CRACK a TCS INTERVIEW AT YOUR COLLEGE! All Rights Reserved to kkmaterials @ 2012. Powered by Blogger.